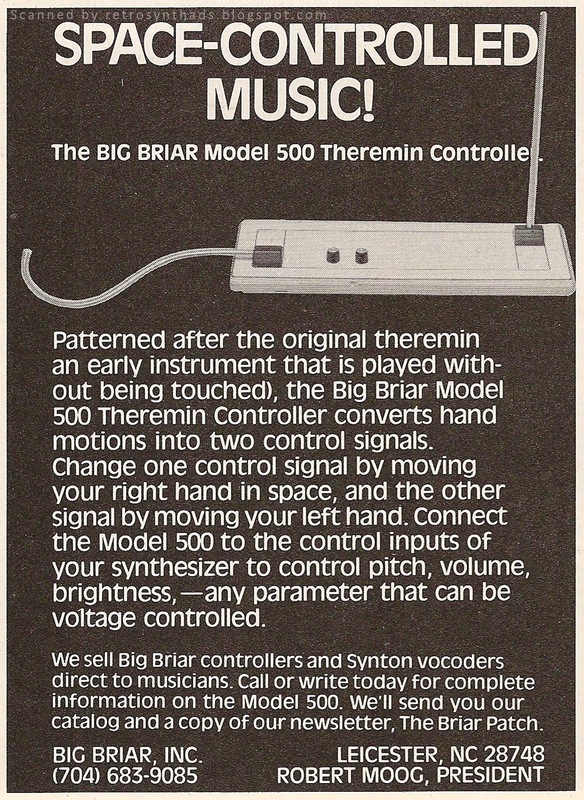 Big Briar Inc.'s Model 500 Theremin Controller "Space-Controlled Music" black and white 1/4-page advertisement from the bottom-left corner of page 60 in the May 1984 issue of Keyboard Magazine. "Space-controlled music"! Why does the Theremin always get thrown in to the "space" bucket?!?! If you recall from my last blog post, I touched upon (pun intended) Big Briar's Model 331 Touch Plate. A great alternative controller, especially for live performances. I'm trying desperately to hunt one down as we speak. 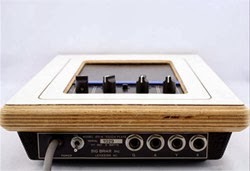 But another even more nifty alternative controller from Bob Moog's Big Briar Inc. around the same time period (and one that I would also love to get my greedy, dirty little paws on) is the Model 500 Theremin Controller. Take the coolness and interactivity of the original Theremin, strip out the audio circuitry, and replace with two control voltage outputs for pitch and volume. Actually... not just for pitch and volume. More on that later. A quick search of the Web found one of the earlier spec sheets for the Model 500 on Spheremusic.com's Web site for one of its auctions for Big Briar's 1982 controller pamphlet and blueprints. Click on that first big image and it will allow you to scroll through the other pages, including an image of the Model 500 page. This page has some great reference info on the 500, including the fact that it came with options for digital outputs and a line-operated power supply. Image from the Buxton Collection. Click to view Web page. 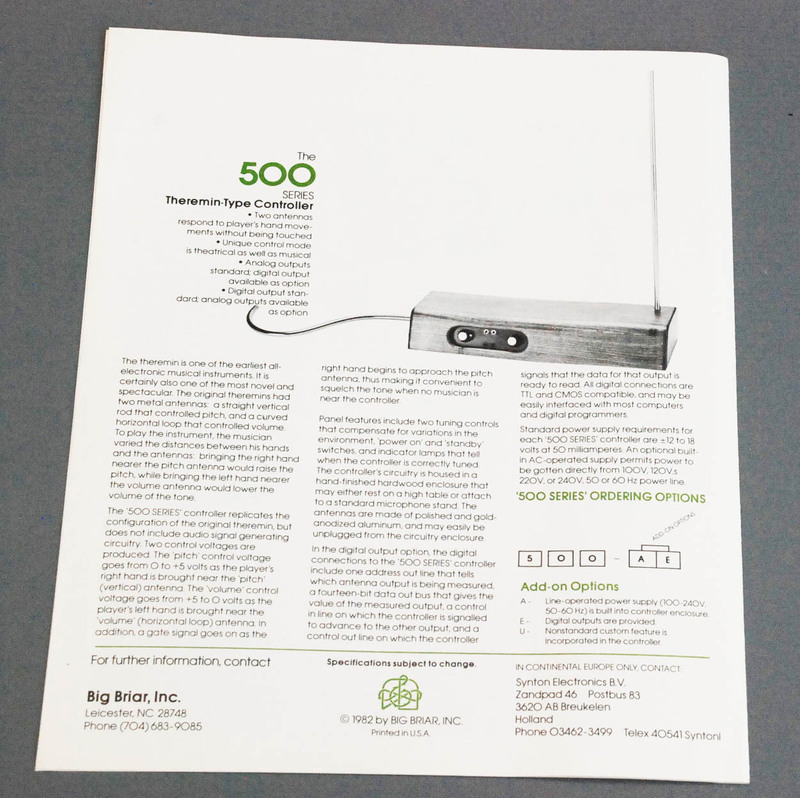 The actual design of the Model 500 Theremin Controller looks to have changed quite a bit between that 1982 pamphlet and the 1984 ad. From what basically looked like a block of wood to something that more closely resembled the sleekness of the Model 331 touch plate. Although I couldn't find any good quality colour photos of Model 500 during my quick Google search, I imagine it looks much like that gorgeous photo of the Model 331 found on that Buxton Collection Web site I linked to last week (see image at right). Design aside, its those control voltage outputs I love most. Let me repeat that, and maybe yell it - CONTROL VOLTAGES!!! So, as the ad states, you can connect this baby to your favorite synth (such as a lovely Moog Modular synth) and start controlling "pitch, volume, brightness - any parameter that can be voltage controlled". According to the pamphlet, there was also the addition of a gate signal "that goes on as the right hand begins to approach the pitch antenna, thus making it convenient to squelch the tone when no musician is near the controller." What this all does is open up Theremin-like control to a much wider range of sound. Any waveform you can create with your synth can be theremized (so too is a word! And if it's not, that shizzle needs to be trademarked pronto). All this brings me to another reason I'm stoked about this ad. 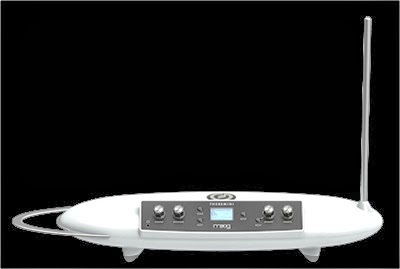 NAMM has just concluded, and one of the products that stood out for me and my close circle of online synth-nuts was Moog's new Theremini. Damn! That's the spaciest-lookin' Theremin yet! That thing would look as good in my studio as it would on the set of Star Trek's control room. And the best news is that, like the Model 500 Theremin Controller, the Theremini opens up a whole new range of sounds to the user by including "a powerful sound engine derived from Moog's award winning synthesizer, Animoog"! PLUS you get pitch-correction for us beginners, pitch CV out, and a mini-USB jack for MIDI. MoFo! Are you kidding me? Do I have to punch you all in the neck to show you how excited I am. *This* has just taken #1 spot on my "next piece of kit" list. 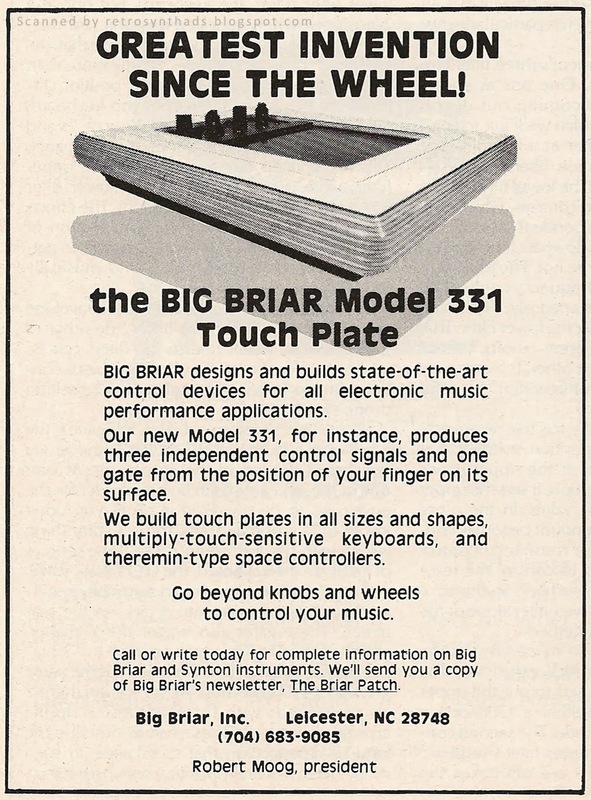 Big Briar Inc.'s Model 331 Touch Plate "Greatest Invention Since The Wheel" black and white 1/4-page advertisement from page 85 in the December 1983 issue of Keyboard Magazine. And this time, that excitement - the pull back to blogging - started as a seed that was planted back during the holidays while I was researching some hardware interactive design ideas for a studio project. That, of course, led me to Google, which then led me to Microsoft Research's Bill Buxton's collection of input and interactive devices. "Bill Buxton is the author of Sketching User Experiences: Getting the Design Right and the Right Design. A Principal Researcher at Microsoft Research, he has a 30-year involvement in research, design, and commentary around human aspects of technology. He was a researcher at Xerox PARC, and Chief Scientist of Alias Research and SGI Inc."
Well Bill, your Web site is the bee's knees and I want you to be my friend. Seriously - your Web site makes me cry - mainly because I want all those toys. I am a *big* fan of calculator/digital watches and that page alone made me pee a little. Now add Nintendo gloves, Etch-a-Sketch, Kraft System Joysticks... the list goes on. With that in mind, you can imagine how excited I became when, under the touchpad section, I found some really nice up-close-and-personal photos of Big Briar's Model 331 Touch Plate. "This is a reminder that makers of electroacoustic instruments have been making touch sensors for years. This one was made for me by Bob Moog of Moog Synthesizer fame." It was then that I recalled seeing this Big Briar ad while flipping through the December 1983 issue of Keyboard to find that Synthony holiday ad with the hand-drawn groovin' Santa Clause that I posted on Christmas. This is one of the earlier Big Briar ads in Keyboard that Bob Moog created for his then not-so-new company, and it looks to have appeared only twice - in the December and January issues. 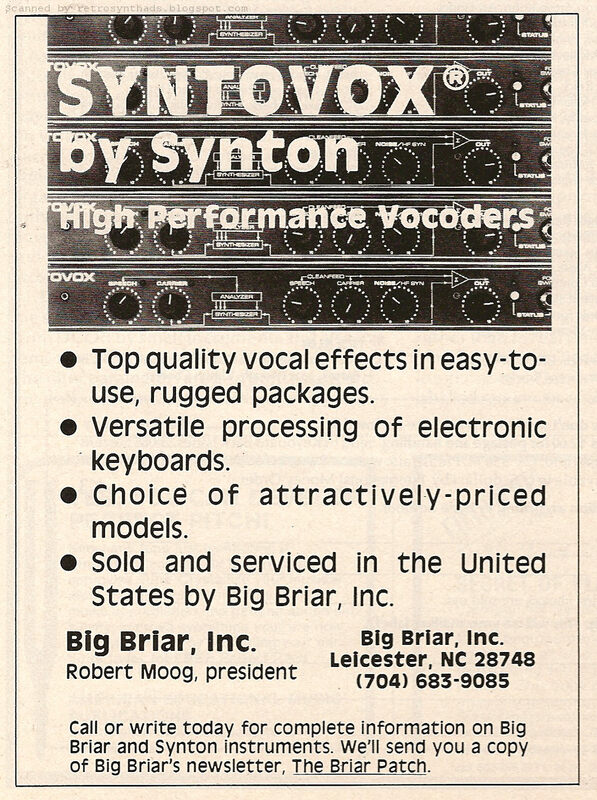 Earlier ads mostly featured Synton equipment, with the name Big Briar appearing as the distributor near the bottom of the ad (see ad at right). This ad is a great exercise in the benefits of size and colour. As gorgeous as that touch plate looks in black and white, the small footprint of the ad (1/4 page) and lack of colour really don't do the Model 311 justice. I think the wood grain and pop of blue that can be seen in Bill Buxton's photos would have really helped sell this thing. Or at least help keep it front-of-mind. I also love the fact that Bob Moog would build these touch plates in all shapes and sizes. Really large touch plates would have made for some great live performances, just as the touch-screens of iPods and iPads, and now larger and larger touch-screen MONITORS, are now appearing more and more often on stage. Now *that* gets me excited.